Born in Winnipeg, Chris Leithner moved to Australia many years ago and runs the private investment firm Leithner & Company. He is a long-time contributor to Le Québécois Libre. 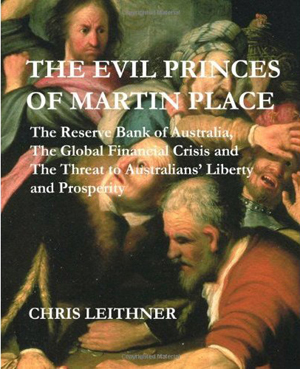 After authoring The Intelligent Australian Investor in 2005, he has just published The Evil Princes of Martin Place, an essay on the role of central banks in manufacturing economic crises from an Austrian economics perspective. A panic exposes the essence of banking as no lecture, book or diagram can do. The essential truth about the [fractional reserve] bank is that it is no ordinary safe-deposit box. Every dollar of the depositors’ money is not in storage on the premises all the time. Some of it is, indeed, stacked in the safe, but rare is the bank … that could meet a demand for cash from all its depositors at once. The art of banking is always to balance the risk of a run with the reward of a profit. Five years ago I aspired to ruffle a few feathers, and am pleased that, at least in one instance, I apparently did. Today I’m more ambitious: I intend that this book cause deep and abiding offence within what it calls the Australian welfare state of credit. In particular, I hope that it outrages central bankers, commercial bankers, mainstream economists, journalists, lawyers, politicians and the legions of other enthusiasts of the monetary distemper of our times. Far more importantly, I also hope that it shocks ordinary Australians into a greater interest in the utterly fraudulent foundations of modern banking and finance. Only by grabbing their attention and directing it towards a mountain of logic and evidence (none of which is mine, most of which is hundreds and some of it thousands of years old) can I provoke them to think; and only by thinking for themselves and from first principles might they conclude, as I did long ago, that today’s monetary institutions and policies are as deeply immoral as they are severely damaging. This book answers two simple questions. What caused the “Global Financial Crisis” (GFC) that erupted in mid-2007 (and whose associated worldwide economic recession, I believe, is still in its early innings)? What will be the consequences of the actions undertaken by governments to combat it? I show that the more things change, the more they stay the same: the GFC is merely the latest in a long series of economic and financial crises that have punctuated the history of the past 250 or so years. Like its predecessors, three of which we will analyse in detail, poor policies – in particular, the existence of legal tender laws, fractional reserve banking and central banking – are the GFC’s ultimate causes. The intervention of government, in other words – and not the free market – causes financial and economic crises. Accordingly, the disappearance of crises necessitates the repeal of pernicious laws and the abolition of damaging practices. Why Are Central Banks Revered Rather Than Reviled? It is the duty of the Reserve Bank Board … to ensure … that the powers of the Bank … are exercised in such a manner as, in the opinion of the Reserve Bank Board, will best contribute to: the stability of the currency of Australia; the maintenance of full employment in Australia; and the economic prosperity and welfare of the people of Australia. It’s high time that somebody finally blew the whistle and pointed an accusing finger: the Federal Reserve System (“Fed”) and the Reserve Bank of Australia (RBA) – like all other central banks – have failed utterly, completely and miserably to achieve these objectives. (Indeed, Chapter 8 will demonstrate that their achievement is, as a practical matter, simply impossible.) As an example, consider “stable prices” and “the stability of the currency.” Figure 1 plots the purchasing power (PP) of the $A and $US since the formation of the Fed and RBA in 1913. (2) Within a decade of the Fed’s birth, the purchasing power of the American currency halved: the basket of consumer goods and services that cost $US1 in December 1913 cost exactly twice as much in March 1920. PP subsequently rose from $US0.50 to $US0.78 by the nadir of the Great Depression in 1933. Since then, however, its slide has been unrelenting – to a derisory $US0.0454 in July 2010. The consumer goods and services that cost $US1.00 at the beginning of 1913 thus cost $US22.02 in mid-2010. That’s a total rise of consumer prices of no less than 2,102% during the past 97 years. Who in his right mind calls that success? The U.S. has enjoyed many things since 1913, but a stable (in terms of its PP) currency simply hasn’t been among them. The RBA has trashed the $A’s purchasing power even more thoroughly. The basket of consumer goods and services that cost the equivalent of $1.00 in 1913 cost more than three times as much ($3.49) in 1920; as a result, the PP of the $A plummeted to $A0.29. As in America, so too in Australia: PP subsequently rose – indeed, doubled – to $A0.41 in 1933. Since then, however, and as in the U.S., its slide has been unremitting – to a derisory $A0.0097 in 2010. In other words, the consumer goods and services that cost $A1.00 at the beginning of 1913 cost $A102.98 in mid-2010. That’s a total rise of consumer prices of almost 5,000%! The Federal Reserve took 68 years – from 1913 to 1981 – to crush the PP of the $US from $1.00 to $US0.10. The RBA needed only 55 years. What about the era of allegedly “low inflation” since the early 1990s? The $A has lost half of its PP since 1988; and it has lost one-fifth since 2004. Since the Great Depression, Australia has enjoyed many things; but at no time since then has it enjoyed anything that by any reasonable standard could be called “stable prices.” As we’ll see in subsequent chapters, most of the conventional wisdom and mainstream propaganda about central banks and monetary affairs is at best misleading and at worst flatly incorrect. It’s vital to understand that there’s more than correlation at work here: this book will demonstrate that central banks such as the Fed and RBA have caused the destruction of their respective currencies’ purchasing power. (This fact is closely related to another, which we will also describe and substantiate: far from smoothing the ups and downs of the business cycle, as the mainstream relentlessly asserts, central banks have exacerbated them.) 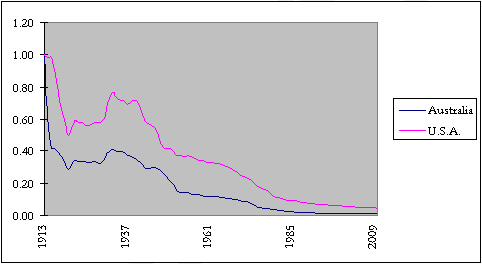 As an initial point of corroboration, Figure 2 plots the PP of the U.S. dollar and British pound since 1800 – that is, during the approximately 100 years before and the approximately 100 years after the advent of modern central banking in these two countries. 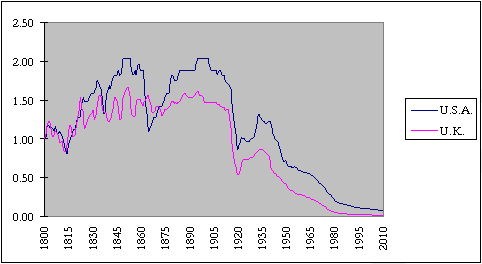 It shows that before (a) the abandonment of the classical gold standard during the First World War and (b) the creation of central banks with interventionist mandates (such as the Fed in 1913 and the Bank of England’s policy since the First World War), the purchasing power of the $US and £ remained relatively stable. The American Civil War – during which the U.S. abandoned the gold standard – provides the major exception to this stability. Since the Great Depression, however, these currencies’ PP has inexorably fallen and cumulatively collapsed. In other words, under the relatively “free market” situation – namely the classical gold standard – that prevailed before the rise of modern central banks and their interventionist monetary policies, currencies didn’t just retain their purchasing power over long periods of time: it rose appreciably. What cost $1 in the U.S. in 1800, for example, cost just $0.58 in 1913 (and $0.49 as recently as 1901). During this interval, the prices of goods and services fell at a compound rate of 0.5% per year. If you bought the same goods and services in 1800 and 1913, they would have cost $1.70 and $1 respectively. Clearly, the dollar bought much more in 1913 than it did in 1800; at the same time, people’s wages rose by a cumulatively very significant amount during these years; as a result, and thanks partly to the gently falling prices of goods and services, standards of living rose dramatically. In sharp contrast, goods and services that cost $1 in 1913 cost $22.02 in 2010 ($1/$22.02 = $0.045). In other words, if you bought exactly the same products in 2010 and 1913, they would cost you $1 and $0.05 respectively. Clearly, the dollar buys much less today than it did in 1913. Under the watch of the Federal Reserve System, then, the PP of the dollar has plunged 95%. Other central banks have, to greater (like the Bank of England) or lesser extents, also presided over the destruction of their respective currencies’ purchasing power. "This book answers two simple questions. What caused the “Global Financial Crisis” that erupted in mid-2007 (and whose associated worldwide economic recession, I believe, is still in its early innings)? What will be the consequences of the actions undertaken by governments to combat it?" In 1800-1807, the PP of the dollar rose by 16% (i.e., from $1.00 to $1.16). This period almost perfectly coincided with the presidency (1801-1809) of Thomas Jefferson and his policy of “hard money,” continuous cuts to taxation and expenditure, and resolute reduction of the national debt. In 1808-1819, PP decreased by 30% (i.e., from $1.16 to $0.81). During these years, the U.S. fought the War of 1812 – and incurred much inflation, taxation and government expenditure, and added greatly to the national debt. The inflation culminated in the Crisis of 1819. In 1820-1833, PP increased 88% (i.e., from $0.91 to $1.75). During this period, “hard money” presidents governed; hence taxes and government expenditures fell. Andrew Jackson, who abolished the Second Bank of the United States (a forerunner of the Fed) and repaid all but $38,000 of the national debt, was most notable in this regard. In 1834-1837, PP fell 22% (i.e., from $1.69 to $1.32). This period coincided with the inflationary distortions of state-chartered banks. The liquidation of these distortions (and many of these banks) culminated in the Crisis of 1837. In 1838-1861, PP increased 43% (i.e., from $1.32 to $1.89). The national debt stood at $15m when James K. Polk took office in 1845. Fortunately, he was a hard-money and a low-tariff man; alas, and like Jefferson and Jackson, he was also a continental expansionist. He coveted California and Mexico’s other northern provinces; and to obtain them he resorted to war. The Mexican War (1846–47) increased America’s national debt four-fold (to $65m). The next presidents, Taylor and Tyler, were Whigs; the Whigs were predecessors of the mercantilist Republican Party; as such, they were indifferent to government expenditure and debt. Under their administrations (Taylor died shortly after taking office), debt ballooned to $80m by 1851. Fortunately, his successor was a Jeffersonian Democrat – and therefore a staunch practitioner of free trade, hard money and frugal government. The last of the Jeffersonians, Franklin Pierce, retired two-thirds of the national debt, such that it fell to $30m (an amount less than 5% of GDP) when he left office in 1857. Neither in absolute amount nor as a percentage of GDP would the national debt ever again fall so low. In 1862-1865, PP plummeted 41% (i.e., from $1.89 to $1.11). These years coincide almost perfectly with the War to Prevent Southern Independence (1861-1865), during which the U.S. Government abandoned the gold standard and undertook a hitherto unprecedented program of inflation, taxation, expenditure and borrowing. 1893-1897). Cleveland doughtily opposed inflation, imperialism, high tariffs and subsidies to business, farmers and veterans. He also vetoed legislation more frequently than any president up to that time. The Crisis of 1893 occurred between Cleveland’s two terms of office. In 1902-1913, PP decreased 16% (i.e., from $2.04 to $1.72). During these years, called the “Progressive Era” in the U.S., the government’s expenditure and taxation rose, as did its regulation of the economy. In 1914-1920, PP plummeted 51% (i.e., from $1.72 to $0.85). In 1913 the Federal Reserve System commenced operations and in 1917 the U.S. Government intervened in the First World War. As a result, there occurred a hitherto unprecedented (that is, bigger than the Civil War) program of inflation, taxation, expenditure and borrowing. In 1921-1932, PP increased 55% (i.e., from $0.85 to $1.32). The Harding and Coolidge administrations (we will see that Harding was by far America’s greatest president of the 20th century) slashed taxation and expenditure and repaid a significant portion of the national debt. Since 1933, PP has decreased 94% (i.e., from $1.32 to $0.08). During these years, in order to finance the New Deal’s endlessly rising welfare at home and almost continuous warfare abroad, both the U.S. Government and Fed have followed a policy of incessant high inflation (greatly facilitated by the abandonment of the currency’s link to gold), high and rising taxation and exponentially growing government expenditure and borrowing. As a result, in mid-2010 America’s national debt reached $13 trillion (“on balance sheet”) and up to $100 trillion (“off balance sheet”) – which means that the U.S. Government is effectively bankrupt. (4) America’s bankruptcy is the New Deal’s legacy; as such (and next only to Abraham Lincoln and Woodrow Wilson) it makes Franklin Roosevelt the worst president in U.S. history. The British figures show remarkably similar trends. Between 1803 and 1815, Britain fought major wars in Europe and North America, incurred much inflation, taxation and government expenditure, and added greatly to its national debt. As a result, the pound’s PP fell. It subsequently recovered all of its losses and more: by 1822, its PP stood 22% higher than it did in 1800. During the next 90 years – which was a time of free trade, the “hard money” of the classical gold standard, low taxation, small and balanced budgets and therefore of a government small enough to fit inside the constitution – the pound’s PP remained astonishingly stable. As in America and Australia, so too in Britain: the First World War was a turning point for the significantly worse. During the War, when the Bank of England assumed its modern guise as the state’s financier and manager of the economy rather than a mere custodian of sound money, the PP of the pound plummeted 62% (i.e., from £1.39 in 1914 to £0.53 in 1920). As in America and Australia, so too in Britain: PP then rose by 60% (i.e., to £0.85) in 1936. Finally, in Britain as well as Oz and the U.S., the Great Depression provided a seemingly permanent turn for the dramatically worse: since 1936 the pound’s PP’s has virtually disappeared – to £0.02 (just one fiftieth of its PP in 1800!) in 2010. More specifically, we will see that welfare and warfare – and the vast amounts of inflation required to finance them – inevitably weaken and eventually destroy the currency’s purchasing power. The inflation that necessarily underpins what we will call the welfare-warfare state enriches the privileged few; it also foments the financial crisis on Wall Street that becomes the economic crisis on Main Street. Conversely, soundly-based money, low and falling government expenditure, as well as the reductions of taxation and inflation, augment the currency’s purchasing power – and also encourage peace at home and abroad, soundly-based growth and prosperity. Today, the Australian and American dollars, British pound, etc., buy vastly fewer goods and services than they once did; at the same time, wages in these and most other Western countries have risen – but at a relatively sluggish pace since the 1970s. The result is that – subject to a critical caveat – standards of living rose at a rather robust pace in the three decades after the Second World War, but at a significantly slower pace since the 1970s. What’s the caveat? In recent times families have been obliged to take drastic action to protect their standards of living. During the 19th century, women (whether single or married) undertook paid work because economic necessity obliged them to do so. By the 1950s, however, relatively few married women worked outside the home. Prosperity had advanced to a point where a single income often sufficed to provide a family with a middle class standard of living. That reality didn’t last long. The campaign waged since the 1970s to convince women that they are economically equal to men – and have, therefore, every right to join their husbands in the workplace, thereby creating a society in which, by the 1980s, most middle-class homes earned two paycheques – has served as a cover with which to mask the eroding standard of living over the last 50 years. Today’s middle-class Americans, Australians, Britons, etc., live much better than their parents or grandparents did because they enjoy the benefits of myriad and momentous technological advances and because both partners must work. Most families could not service the mortgage, periodically buy a new car and regularly take holidays, etc., on one income. In the 1950s, membership of the middle class often required only one salary; today, it usually requires two. Why hasn’t this de facto erosion of living standards angered people? They’ve maintained a material standard of living that exceeds their forebears’ because technological advances, a more advanced division of labour and a vastly heavier load of debt play such important roles in their lives. They know something that academics and politicians apparently don’t: the re-entry of women into the paid workforce is usually not some advanced and noble achievement of equality; as it was before the 1950s, it’s once again a brute economic necessity. It’s an essential feature of modern society because it’s an inevitable consequence of the central bank’s gradual destruction of the dollar’s purchasing power. The middle class, in short, has been fleeced. Many of its members know it, but don’t quite know how. If a woman wishes to work outside the home, bless her and more power to her (see in particular Proverbs 31: 11-25), but let’s not pretend that it’s a moral breakthrough. And let’s reject outright the nonsense that it’s a consequence of allegedly enlightened attitudes and a benefit of the modern welfare state. Instead, let’s identify it for what it is: a consequence of misguided monetary institutions and poor monetary policies. In this book we will reason to the conclusion that there’s only one sensible thing to do with central banks such as the Reserve Bank of Australia: abolish them and consign them to the dustbin of history. The mainstream will shriek in horror at this “radical” conclusion. The real question (which, of course, they refuse to ask) is: why not rid ourselves of an institution that has almost completely destroyed the currency’s purchasing power and has exacerbated the cycle of boom and bust – particularly when free market arrangements have shown that money need not lose its purchasing power, and that they can actually increase it significantly over long stretches of time? “A central bank … must grow like a living organism within the environment provided by the financial and economic system in which it exists; its practices and structure must evolve in response to the needs and demands of that system.” So wrote H. C. “Nugget” Coombs, the first Governor of the RBA, in 1951. (7) I don’t think he appreciated either the significance or the true meaning of those words. This is because “a central bank,” as Vera C. Smith wrote in her classic The Rationale of Central Banking and the Free Banking Alternative (1936), “is not a natural product of banking development. It is imposed from outside or comes into being as the result of Government favours. This factor is responsible for marked effects on the whole currency and credit structure which brings it into sharp contrast with what would happen under a system of free banking from which Government protection was absent.” In light of Smith’s insight, Coombs unintentionally affirmed one of this book’s principal findings – namely that central banks exist not in order to cater the needs of the general population, but rather to serve (i.e., finance) the state that creates them. As a result, and as we shall see, a small number of “insiders” gains handsomely and the mass of “outsiders” loses heavily. For centuries, fractional reserve banks – which we’ll define and describe in detail, and which comprise virtually all contemporary banks – have misappropriated depositors’ funds and counterfeited money. Contemporary monetary institutions, practices and policies, in other words, are built upon a foundation of “legalised” fraud. For this reason, and also as a consequence of their inherent illiquidity, fractional reserve banks are at all times, and not just during financial and economic crises, bankrupt. Without the constant and active intervention of the state in general and its central bank in particular, their bankruptcy would be plain for all to see. Central banks don’t fight inflation: they manufacture and maintain it. These days, only the actions of commercial and central banks can create inflation. The legislation and regulations that underlie the banking system inflate the boom that inevitably busts. The state has embedded its protections of commercial banks so deeply within legislation and regulations – in other words, it has extended such enormous privileges to banks for such a long time – that virtually nobody now recognises bankers for what they have always been: massively featherbedded white-collar wharfies. When examined in the light of Christian theology (particularly of St Augustine of Hippo, St Thomas Aquinas, Bishop Nicolas Oresme and Popes Pius XI and John Paul II), central and fractional reserve banking is certainly deeply immoral and likely anti-Christian. 1. Sources of data: U.S. Bureau of Labor Statistics (http://www.bls.gov/cpi/) and Reserve Bank of Australia (http://www.rba.gov.au/calculator/annualPreDecimal.html). 2. “Purchasing power” means the quantity of goods and services that a unit of currency can purchase at a given point in time. The greater the quantity, the greater the currency’s purchasing power. The origin of the RBA is difficult to specify. One candidate of its genesis is the Commonwealth Bank Act 1911; others are Commonwealth Bank Acts of 1924 and 1945. (Before the passage of the Reserve Bank Act 1959, the Commonwealth Bank undertook many of the actions which came to be associated with central banks.) In 1960, Sir John Phillips, the RBA’s inaugural Deputy Governor and its second governor, remarked “the Reserve Bank, though a new institution … really has its roots spread back over the last forty-seven years or so …” For convenience, I’ll date the RBA’s birth to coincide with that of the Fed in 1913. For a short history of the RBA’s origins and evolution, see Selwyn Cornish, The Evolution of Central Banking in Australia (Reserve Bank of Australia, 2009), Chaps. 1-2. 3. Source of data: American figures before 1971 come from U.S. Bureau of the Census, Historical Statistics of the United States, Colonial Times to 1970, Bicentennial Edition (Washington, DC: Government Printing Office, 1975), series E135; figures since 1970 come from U.S. Bureau of Labor Statistics; and British figures come from the Bank of England’s “inflation calculator” (http://www.bankofengland.co.uk/education/inflation/calculator/flash/index.htm). See also Jim O’Donoghue, et al., “Consumer Price Inflation since 1750” (Office for National Statistics, Economic Trends, March 2004). 4. See Chris Leithner, “Avoid the Rush: Prepare Now for America’s Bankruptcy” (LewRockell. com, 13 February 2007). Lawrence Kotlikoff (“U.S. Is Bankrupt and We Don't Even Know It,” Bloomberg News, 11 August 2010) says “let’s get real. The U.S. is bankrupt. Neither spending more nor taxing less will help the country pay its bills.” The President of the Federal Reserve Bank of Dallas seems to agree. See also Richard Fisher, “Storms on the Horizon” (Remarks before the Commonwealth Club of California, San Francisco, 28 May 2008). Kotlikoff adds (“Is Uncle Sam Bankrupt?” National Center for Policy Analysis, January 2010), “when it comes to nondisclosure, the U.S. Government is the father of all financial malfeasants. Indeed, Uncle Sam has been misrepresenting the nation’s finances for decades. In the process, he has run up an undisclosed bill that makes the financial bailout and economic stimulus spending look paltry … Given the magnitude of the fiscal gap, the country is broke. The United States is currently short more than $77 trillion and this figure will only increase. In fact, it is estimated that the total gap will amount to nearly $80 trillion in 2010. The United States Government, through its various financial agencies, is assuming away the country’s fiscal problems rather than confronting and correcting them. Without dramatic and immediate changes in policy, future generations are likely to face lifetime net tax rates that are twice those imposed now.” See also Kotlikoff’s “Is the United States Bankrupt?” Federal Reserve Bank of St. Louis, Review, Vol. 88, No. 4 (July-August 2006), pp. 235-49. 5. Arthur Rolnick and Warren Weber, “Money, Inflation, and Output Under Fiat and Commodity Standards,” Federal Reserve Bank of Minneapolis Quarterly Review, Vol. 22, No. 2 (Spring 1998), pp. 11–17; see also Journal of Political Economy, Vol. 105, No. 6 (December 1997), pp. 1308-1314. 6. Money, Markets, and Sovereignty (Yale University Press, 2009), p. 67. 7. See Coombs’s Foreword to L. F. Giblin, The Growth of a Central Bank: The Development of the Commonwealth Bank of Australia, 1924-1945 (Melbourne University Press, 1951), p. v.